Driven by budget cuts and fierce competition, the satellite industry is exploring a variety of ways to make “access to space” easier and more cost-effective for commercial and government missions. This article discusses some of the ways that U.S. government agencies are working with industry; and creative, non-traditional ways available today to meet next-generation requirements for national defense and space exploration. There are typically 20 to 23 commercial satellites launched to GEO annually. Each of these satellites has the potential to carry additional payloads. The benefits of hosted payloads have been discussed frequently over the last several years and much attention is given to reduced cost, shortened time to launch, and the opportunity to disaggregate important capabilities. However, an often overlooked benefit is the use of commercial ground systems. A primary issue relative to U.S. government satellite systems is the proprietary nature of the related ground infrastructure. These are known to be stove-piped systems, each with its own infrastructure and little or no compatibility between the systems. This makes data transport on the ground less resilient, more expensive to operate, and even more expensive to upgrade. 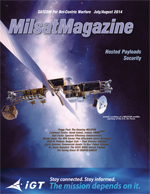 out that the commercial satellite industry provides a remarkably resilient, redundant and widely geographically dispersed array of gateways, teleports and connecting fiber networks that all use interoperable standards. With today’s advanced encryption and data protection schemes, government missions can directly and securely leverage the abundant commercial ground infrastructure for tactical missions. Such may well be that the use of commercial ground infrastructure is one of the substantial benefits hosted payloads brings to this environment. SSL is encouraged by the trend of U.S. government agencies in their move to actively partner with industry to lower the cost of space missions in general. A good example is NASA’s recently completed Lunar Atmosphere Dust Environment Explorer (LADEE) mission (artistic rendition of LADEE is on the previous page). NASA tapped SSL to provide a propulsion system, similar to the one used in its commercial satellites, for the moon orbiter. The mission was highly successful and the propulsion system performed flawlessly. 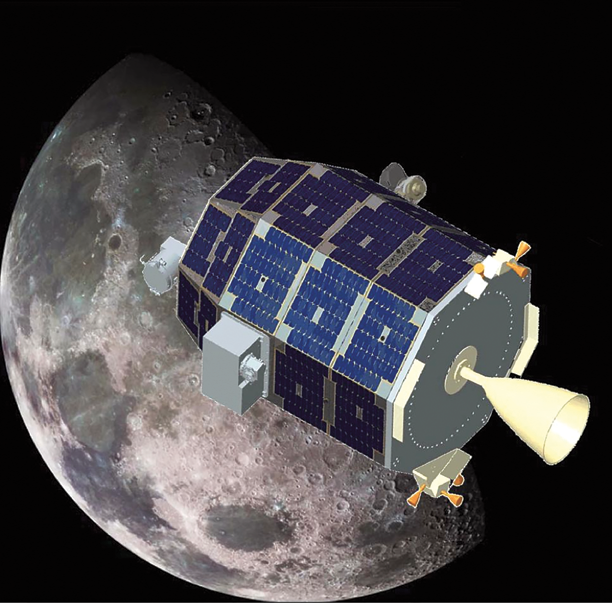 SSL provided the propulsion system for NASA’s successful Lunar Atmosphere Dust Environment Explorer (LADEE) mission. In addition to its primary mission, which was to gather detailed information about the structure and composition of the thin lunar atmosphere, the LADEE spacecraft carried a Lunar Laser Communication Demonstration (LLCD) on board and set a record for transmitting data from the moon to Earth. The test demonstrated high data rate communications that have the potential to transform communications for deep space missions. This successful demonstration is a vital precursor to a more comprehensive and enduring demonstration that will also be facilitated by SSL. NASA Goddard Space Flight Center has contracted with SSL to place a Laser Communications Relay Demonstration (LCRD), as a hosted payload, on its heritage 1300 communications satellite platform. Sponsored by NASA’s Space Technology Mission Directorate and Human Exploration and Operations Mission Directorate, LCRD is a technology demonstration that combines commercial and government developments. By hosting the LCRD payload on a commercial communications satellite built by SSL, this demonstration will be an enduring test bed that helps transition optical communications technology into viable operation. As the optical modules and ground stations for LCRD are being developed, SSL is working with its commercial customers to identify an appropriate host satellite for the demonstration. Laser communications technology is expected to provide next generation capability for NASA exploration missions and may also hold significant benefits for future commercial satellite communications. Most government agencies are now looking at how to leverage the commercial industry to help reduce acquisition timelines and cost. SSL is one of several companies selected by the U.S. Air Force Space and Missile Systems Center (SMC) to develop affordable design concepts for nexgen Protected Military Satellite Communications (MILSATCOM). As a prime contractor leading several protected communications system and technology domain expert companies, SSL focused on providing proven solutions with shorter schedules and lower, better controlled cost, to defend against growing and changing intentional jamming and cyber threats and to deliver advanced communications capability to the warfighter. For many years, commercial satellite operators and manufacturers have addressed changing requirements in mobile communications, broadband, and HD video broadcasting with highly competitive budget and schedule constraints. The SMC’s future Protected MILSATCOM efforts are leveraging this experience to develop cost-effective solutions for secure SATCOM connectivity for highly mobile platforms such as remotely piloted aircrafts and ground command and control vehicles operating in contested environments. The objective of the ongoing SMC program is to advance practical new architectures and technologies to protect increasingly contested and threatened warfighting communications. 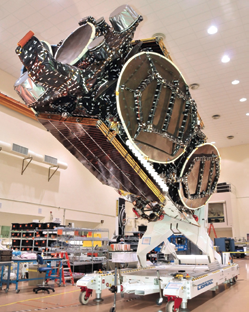 This year, there have been demonstrations of protected communications in Ka- and Ku-band over satellites built by SSL. This potential use of protected waveforms over commercial satellites could also have the benefit of unlocking the value of the integrated ground infrastructure previously discussed. Teaming with commercial satellite operators can provide a variety of innovative means to gain affordable access to space. Smaller payloads can be attached to commercial satellites, sharing a variety of subsystems, as in the traditional hosted payload configuration. As an alternative, smaller payloads can travel to orbit with a commercial satellite and then be released into space as free flyers. Another option for vastly reducing the cost of getting to space is for a government spacecraft to share a launch vehicle with a commercial satellite in a dual launch configuration on a single launch vehicle. SSL is one of the companies working with the U.S. Defense Advanced Research Projects Agency (DARPA) to design and implement a system that will accommodate what DARPA calls the Payload Orbital Delivery (POD) system. This system enables affordable delivery of small, free-flying spacecraft beyond Low Earth Orbit (LEO) by releasing them from a commercial spacecraft, such as the SSL 1300, while in geo-transfer orbit, or after the satellite has reached its final orbital location. This capability can be leveraged for any type of small operational mission such as servicing or science and technology space missions. POD systems could become an important capability for accomplishing missions in a cost-effective way, enabling refueling, on-orbit assembly, inspection, repair or debris mitigation. The expectation is that these capabilities are likely to enable new kinds of missions that aren’t currently thought possible to employ. SSL has sophisticated robotics capability as well as concepts for line replaceable units that will increase the value of future spacecraft and enable valuable assets to be updated in keeping with the rapidly changing technologies that are seen in the terrestrial world. SSL built SES-5 included a hosted payload for the European Commission. Another way the cost of access to space can be reduced is by launching two satellites on a single launch vehicle. All electric satellites reduce mass sufficiently to enable dual launch on U.S.-built launch vehicles. SSL’s electric, orbit-raising solution is based on one of the industry’s highest thrust, highest reliability propulsion systems. The company began developing its electric propulsion technology more than 20 years ago and SSL’s first satellite with electric propulsion was launched in 2004. SSL has an outstanding track record—14 satellites with electric propulsion are currently on orbit with roughly 35,000 hours of successful, on-orbit operation. The SSL all-electric platform is based on the nexgen of this proven thruster. The satellite design has the advantage of enabling dual launch on nearly every launch vehicle, including the Ariane 5, Atlas V, Falcon 9, H-IIA and H-IIB, and the ILS Proton. The platform also has the flexibility to be launched in a single launch configuration. For agencies thinking about low-cost constellations that can be regularly refreshed with evolving technologies, there are a number of innovative LEO platforms being developed. 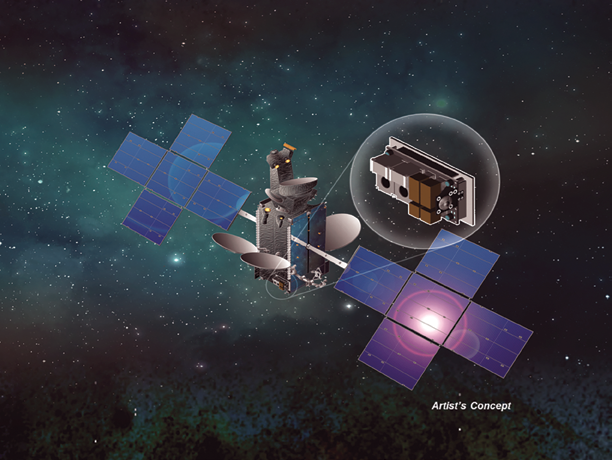 In February 2014, SSL was awarded a contract by Skybox Imaging to build an advanced constellation of 13, small, Low Earth Orbit (LEO) satellites for Earth imaging. This partnership with Skybox gives SSL an exclusive license to the satellite design, which can support a broad range of missions and payloads for commercial and government customers. The satellites are approximately 60 x 60 x 95 centimeters and weigh roughly 120 kilograms and will capture sub-meter color imagery and up to 90-second clips of HD video with 30 frames per second. SSL was delighted to demonstrate that the company could competitively build and deliver low cost, LEOs. While maintaining its focus on commercial GEO communications satellites and traditional hosted payloads, SSL continues to develop new and untapped technologies that will enable the future space infrastructures. With 74 SSL-built satellites in the GEO belt, and a backlog of 22 GEO satellites in the manufacturing facility, SSL provides a highly effective backbone of commercial satellite infrastructure. The company is uniquely positioned to assist the U.S. government leverage regular access to space as a critical component of the nexgen space mission area architectures. Hosted payloads, dispensed payloads, dual launches and low-cost LEOs comprise just a few of the new approaches for government agencies to benefit from partnering with commercial satellite manufacturers and telecom operator, all with two goals in mind—minimize cost yet maximize the use of commercially developed innovation for nexgen spatial systems. Wendy Lewis is Director of Communications for SSL, a full-service provider of satellites and space systems and the world leader in commercial communications satellites. She is responsible for all of the company’s external communications and public affairs. Wendy has worked in the satellite industry since 2006 when she joined SSL and previously worked at a Silicon Valley public relations agency where she supported a broad range of high tech companies. She is an active member of the Hosted Payload Alliance communications committee and also manages investor relations for Loral Space & Communications.